Home / Modern Pest Blog / Are Rodents Taking Up Residence in Your Car? Are Rodents Taking Up Residence in Your Car? Most people have seen a mouse scurry across the floor somewhere they’ve lived. But have you ever spotted a mouse in your car? Maybe even while you’re driving? It happens more than you’d think, and we hear all about it at Modern Pest! Besides being a disturbing surprise, rodents can cause serious damage to your vehicle. Mice, rats, chipmunks, squirrels, and opossums can all damage cars in various ways. It’s dark and often warm in your engine compartment, and it makes the perfect rodent sanctuary. The mouse population is vast right now due to an abundance of fruits and nuts over the last year. A similarly high-yield of acorns caused the squirrel population boom we saw this summer. Are you seeing signs of rodents around your car? Don’t wait until they do expensive damage, call Modern Pest today! So, how do you know rats and mice are living in your car? What damage are they causing while they’re in there? And most importantly, how do you stop them from creating expensive repairs? The good news is that you’re not alone. Modern Pest Services is here to help. How Can a Rodent Damage Your Vehicle? The main ways that rodents, usually rats and mice, damage your car are through chewing, nesting, and waste. Mice defecate and urinate everywhere they go. In addition to a foul smell, this can be dangerous for your health. Mice can spread hantavirus and salmonellosis to humans. Are Your Car Parts Particularly Delicious? 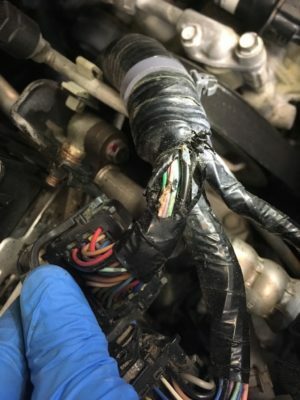 Auto damage from rodents seems to be increasing as automakers use more plant-based biodegradable materials to reduce waste and cost. Switching from petroleum-based to soy-based insulation to wrap wires is more environmentally-friendly, but it also a delicious treat for rodents. There have even been several class-action lawsuits filed against automakers, including Honda and Toyota. However, there are no studies that prove this to be true yet, so it continues to be used. Whether it’s mice, rats, squirrels, or opossums damaging your car, Modern Pest has a solution! Click here to request a quote or schedule service. If your car is in a garage, make sure all pet food and bird seed is tightly sealed so mice aren’t attracted to the area. Don’t leave food in your car, either. Don’t let your car sit for too long. The rodents will get comfy. At least start it on a regular basis. Modern Pest’s Homecare Green program protects against over 50 common household pests, including mice and rats. We can protect your garage like we do your home and keep them out. If it’s squirrels, chipmunks, or opossums living in your ride, our Wildlife Control Team can handle the job. Call Modern Pest today at 1-888-997-3312 to request a quote or schedule service. Don’t be a vermin chauffeur this season.